RoKKiT KiT - Fishing & Nice Persons Club. Orders are typically processed, printed and sent out within 7 business days. But maybe even faster depending on if stock is made. I'll use Aust post for all orders within Australia. Regular Aust Post Shipping - $9 flat rate. Overseas items will be 2-6 weeks via DHL & Auspost - Tracking to most countries - $15 flat rate. Please note: Shipping fees for overseas does not include possible taxes and duties which may be applied by customs in the country where delivery is to be made. The responsibility for any custom duties, foreign taxes or other fees which may be imposed will rest with the customer. I want you to be happy. If you have any issue with a product please get in touch and we will sort it out. I will most probably exchange if a fault is found. The customer will be responsible for the cost of returning goods. Sorry but I won't be giving refunds. All transactions are done in a secure environment. I will never share your personal details. I may from time to time send out an email with relevant information about a promotion or new product. Rest assured this will not be often. 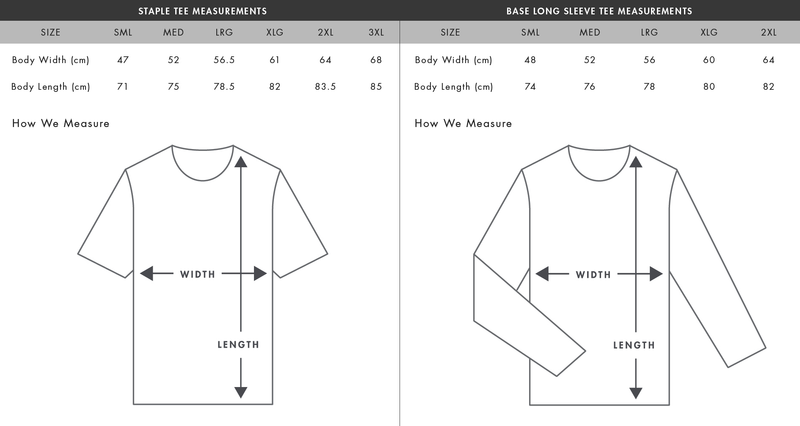 T-Shirt sizes run on the smaller side so if you like a looser fit go a size up then you would normally go. I sit right in between the M and L and I normally fit a Medium in most shirts. The Medium still looks fine but is a little tighter if showing off the guns is a priority :) The large also looks good but has a slightly looser feel. Be sure to get in contact with any issues and queries. RoKKiT KiT Fishing & Nice Persons Club ©2018.